The argument over the role of women in the Church and home, and whether or not women should not have authority over men (in some fashion) is an ongoing and important discussion in Christendom. I continue to look into this subject, but I am at an 80% confidence that egalitarianism is unbiblical and violates natural law. I have a bee in my bonnet over this since I am often accused of being a patriarchal machoist bigot for not being an egalitarian. A: One, and it’s nothing to joke about. Yes, I did just equate egalitarianism with feminism, but yes, egalitarians will have to defend themselves against such similarities, both good and bad. Nevertheless, at the risk of offending the feminist in all of us, let me make my case. And look, I am familiar with and a believer in the adage “in the essentials unity, in the non-essentials liberty, in all things charity.” Our stand on the role of women in the church does not make us a Christian or not, nor should it break fellowship between us – at least, until it becomes part of the local church’s doctrine. Then, we may need to each find a church that suits us. What are the common positions? Christian Egalitarianism – Christian egalitarianism holds that all people are equal before God and in Christ; have equal responsibility to use their gifts and obey their calling to the glory of God; and are called to roles and ministries without regard to class, gender, or race. Hard/Full Complementarianism – assigns primary leadership roles to men and support roles to women based on their interpretation of certain biblical passages from a complementarian perspective. For hard complementarians, this extends to all positions of leadership in the Church, and sometimes even into low views of women leading in the political or commerce arenas. Soft/Partial Complementarianism – Soft complementarians, like myself, believe that men and women are different in both role and related authority in marriage, courtship, and in the polity of churches. We also affirm the paradoxical truths of mutual submission among Christians and of co-leadership of men/women, husbands/wives. If you ask an egalitarian, they’ll tell you that they are attempting to release women into their gifts and talents, so long stunted by patriarchal interpretations of scripture, and I totally agree. However, critics may also be right that the movement has taken an extreme stance, like uber-feminists who went beyond striving for equality to rejection of real biological and psychological differences between men and women, even to the point of reviling the true masculine (as opposed to the false masculine of machoism). Both poles (Egalitarianism and Hard Complemenatarianism) accuse one another of throwing out one side of the equation. Are egalitarians throwing out meaningful role distinctions between male and female? Are comlemenatarians patriarchal and ignoring the real history of female leadership in the early and historic church? As a soft complementarian, it is easy for me to say yes – the two poles are the ‘extremists,’ and my more middle position is the correct balance of what amounts to a paradoxical pair of truths. Is this another clear paradox of scripture? Many profound spiritual truths involve paradoxical pairs – such combos as predestination and free-will, love and mercy, or Jesus’ divine and human natures are well accepted orthodox pairings. As I have argued elsewhere, 2 such pairs are typically held in a 90/10 balance, where one truth is the primary, and the secondary exists to set limits on the primary to avoid a one-sided heresy (yes, I used the H word for such one-sided equations). The question then becomes, is this, as us Soft Complementarians claim, a case where there are two competing truths which must be kept in tension, or, as egalitarians claim, is there only one truth of equality? Or to dive in deeper, as per egalitarianism, are fundamental value, moral, role, and authority equality independent attributes, or are role and authority somehow tied together, as complementarians insist? We can agree that men and women are of equal fundamental and moral value, and are equal, especially “in Christ,” where there are no distinctions in these areas (Galatians 3:28). We can agree that patriarchal views have predominated in the church, and turned the possibly valid principles of complementarianism into a sexist suppression of women. The real question comes in the interplay between gender roles and authority. Complementarians argue that women and men have obviously different roles (and to some extent, egalitarians would agree), but that such roles also reflect on the proper hierarchy of authority within the home and church. 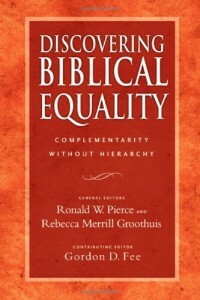 Egalitarians like Rebecca Merrill Gruthuis counter that giving one person authority over another, especially based on intrinsic qualities like gender, is inherently unjust and in-egalitarian and violates the equality mentioned in Galatians 3:28. Complementarians respond that differences in authority (subordination) do not equate to differences in value or being – that they are as innocuous as admitting that women can breast feed and men cannot. There’s no value judgment made here, being in authority does not imply greater value, and giving one person authority over another is not a judgment on the underling’s value or competence. Sure, Jesus was for a while submitted to God, but that did not rob him of his divinity, value, or equality with God, nor does it when he eventually surrenders his authority to the Father in the end (1 Cor 15:28). But perhaps competence to wield authority is the key issue here – men have certainly showed themselves capable of the grossest incompetence in leadership, both moral and intellectual. Why not give women, who have in other arenas proved their relative equality of leadership skills, the chance to lead the church, or certainly the home? This is a valid challenge to hard complementarians, who have to deal, not only with the examples of deaconesses and prophetesses in the New Testament, but the few but real examples of judges, queens, and business women in Old Testament Israel. However, soft complementarians may have a nuanced approach that affirms the ‘natural’ truths of male headship (if such a thing exists) and gender equality – though their approach may make neither of the poles happy. The head of every man is Christ, the head of woman is man, and the head of Christ is God…A man should not wear anything on his head when worshiping, for man is made in God’s image and reflects God’s glory. And woman reflects man’s glory. For the first man didn’t come from woman, but the first woman came from man. And man was not made for woman, but woman was made for man. For this reason, and because the angels are watching, a woman should wear a covering on her head to show she is under authority. Interestingly, both the cardinal order (man first) and the hierarchical order (man as created to hold authority) play into the discussion. So again, I ask the question, is any gender-based differentiation of authority in violation of the full equality we have in Christ? If so, then there is no paradox here, no spectrum or gray zone inbetween the two poles – there is only right (egalitarianism) and wrong (hard complementarianism). Women can take all the positions of church, and co-partnership in authority in the home is the only rule, with both partners also in mutual submission (Galatians 3:28, Ephesians 5:21). Or, is it valid to say that in spiritual government (Church, home) as opposed to secular (civil and commerce), there is a biological, natural, biblical principle that ultimate authority must be with a man, else we violate some spiritual law? If so, then we must admit that both equality and a type of inequality (in authority) exist in some paradoxical formulation, and we may then have to reject both full egalitarianism and complementarianism. I avoided the voluminous arguments around the relevant passages, attempting to present the essential cores of the arguments as I see them. I haven’t yet justified, either exegetically or philosophically, my soft complementarian position. So I’m not really asking you to join me yet. But I am asking you to think about this with me, even if I have a bias. I hope to present my summation of the arguments that convince me in a future post.